Of course, the biggest topic in the media and on teh Interwebz right now is ObamaCare, aka the aptly named Affordable Care Act. Of course. We've gone over this before. The ACA is the perfect name for this Fascist take over of the Health Care and Insurance industry, just like everything else in our Brave New World Order. Such a ludicrous name for this Government sponsored and enforced cartel creation is based on the principle of Inversions. Cue the outrage and anger from all the voters who assented to their slavery by pulling the lever in the curtained booth at their nearest youth brainwashing facility to participate in the Democratic selection of the most authentic President we've ever had presiding over the country in the past 100 years. Many of these proud participants of democracy are flabbergasted and furious now that they are discovering the health insurance cancellation notices that have begun to arrive in their mailboxes. We voted for Affordable Care! The question you forgot to ask was this: Affordable for whom? Affordable operating expenses for the Healthcare Insurance Cartel, and affordable for the Healthcare - Pharmaceutical - IT Industrial complex, that's who. What, you actually thought we live in a free country with a Government elected for the people, by the people? To those of you still clinging to the ethereal wisps of the rapidly disintegrating phantasm formerly known as THE AMERICAN DREAM, this is your wake up call. Their are two kinds of people in USA Inc. Human beings, and Corporate beings. Haven't you heard? Corporations are people too! Not only are they legally considered people now, they actually have more rights and privileges than the human people. All people are equal, it's just that the Corporate people are more equal than the human people. 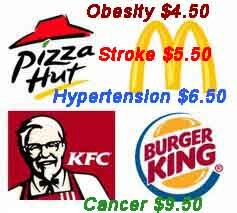 I don't recall where, but I recently came across an article linked in some comment section somewhere on teh Interwebz, that referred to this 2010 study published in the American Journal of Public Health: Life and Health Insurance Industry Investments in Fast Food. Previous research on health and life insurers' financial investments has highlighted the tension between profit maximization and the public good. We ascertained health and life insurance firms' holdings in the fast food industry, an industry that is increasingly understood to negatively impact public health. Insurers own $1.88 billion of stock in the 5 leading fast food companies. Got that? All of the corporate cartels that OWN this country, collude to create profit streams amongst We the Sheeple. They collude to make us sick, then sell us the medicine and treatments to make us last long enough to pay them until we're broke, used up and impoverished or dead. I've previously written about how the Big Agriculture Corporations are also shareholders in the Pharmaceutical Corporations, to create health problems and degenerative diseases amongst all the human people for which the Pharmaceutical Corporations then supply the meds to treat the symptoms of those problems. Well, now we see the other side to this triangle of corporate collusion - the Insurance Cartel is heavily invested in the Fast Food industry that also plays a key role in creating the future customers of the Healthcare Industry that we are all now legally required to buy insurance from to receive their services. The Insurance Corporate people invest in the Fast Food Corporate People, who manufacture their products from the Agricultural Corporate People. The human people eat the fast food, and eventually they get sick, thereby getting their Pharmaceutical Corporate People's products prescribed to them by the Healthcare Corporate People...who get their profits from the Insurance Corporate people, so that they can ameliorate the symptoms caused by the Corporate People's manufactured feed. That way the human people can stay ON FEED until they die, with all the Corporate people profiting off their sickness and death, every step of the way. Shall we name some names of these Corporate people? Major insurers own $1.88 billion of stock in the 5 leading fast-food companies, representing 2.2% of total market capitalization of these companies on June 11, 2009. United States–based Prudential Financial, an investment firm that also provides life insurance and long-term disability coverage, has fast food holdings of $355.5 million, including $197.2 million in McDonald's, $43.7 million in Burger King, and $34.1 million in Jack in the Box. United Kingdom–based Prudential PLC offers life, health, disability, and long-term care insurance and owns $80.5 million in stock of Yum! Brands, owner of KFC, Pizza Hut, Taco Bell, and others. Standard Life, also based in the United Kingdom, offers both life and health insurance and owns $63 million of Burger King stock. Canada-based Sun Life and Manulife offer life, health, disability, and long-term care insurance. Sun Life owns almost $27 million of Yum! Brands stock, and Manulife owns $146.1 million in fast food stock, including a $89.1 million stake in McDonald's. Holland-based ING, an investment firm that also offers life and disability insurance, owns $12.3 million in Jack in the Box, $311 million in McDonald's, and $82.1 million in Yum! Brands stock. Guardian Life, MetLife, New York Life offer life, health, disability, and long-term care insurance. Northwestern Mutual and Massachusetts Mutual Life Insurance Company offer life, disability, and long-term care insurance. All of these companies are invested in the fast food industry to varying degrees. Northwestern Mutual's stake is the biggest, with its total investments in excess of $422 million, including $318.1 million in McDonald's alone. Massachusetts Mutual owns more than $366 million of fast food stock, with its single biggest investment being $267 million in McDonald's. This, folks, is what Fascism really looks like. It's not tyrannical authoritarians in brown shirts, jack boots, or riot gear beating down the sheeple with truncheons to force compliance to their ideology. It's the Corporate people merging with the power of the Government to rule, exploit, and consume all of the nation's human resources. And the Fascist Corporations that rule us, literally show us to our faces what and who they are. 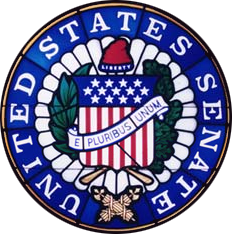 To see it, you only need learn to recognize the symbol that is their calling card: the fasces. THEY are telling us with their symbols presented in plain sight, exactly what kind of country we have here. Let's play a game called "Where's the fasces?" JFK? LBJ? Democrats? Liberals? Progressives? Look closer at the memorial for Honest Abe. Socialism, Capitalism, Feminism, Communism, Nazism, ...all the "isms" are nothing more than separate sticks, all bundled together to prop up the only true political system that rules our Brave New World Order. Where you find the fasces, you find the fascists. There's been a threatened labor strike brewing for the last month here in Seattle among the supermarket chains---it seems the corporate overlords told the workers that, since they now have Obamacare, there's no need for the corporations to provide health insurance anymore. The unions---a bunch of die-hard socialists---totally exploded with outrage. "What! Sure we all supported Obamacare, but you mean that it includes US too!!!" Seattle could have been the template for the movie 'Idiocracy'. It doesn't surprise me either about the Insurance Cartels investing heavily in junk-food. Just like Big Pharma leads the charge in the so-called 'Drug War' or the media punks who invest in the police state while denouncing it out of the other sides of their big mouths! Yes Eric, it would be amusing if it weren't so bad for us all. Still, there is some entertainment value in watching so many Obama voters being hoisted by their own petard when they realize just how the "free" healthcare they thought they were voting for, is going to cost. In Canuckistan, corporations are encouraged to come here, and they are willing to do so, because Canada has socialized healthcare. It becomes apparent why so many companies like it, because they can transfer the individual cost of the employee's health premiums off onto the greater taxpayer. And you wonder why billionaires support left wing causes, eh? Oh, and following close on the heels of ObamaCare, there's a proposed new set of rules for farmers: the Food Safety Modernization Act. It's basically a threshold move to make sure that small farmers NEVER compete with Big Agri. Here's a summary, and here's a different take on it--but basically, it's a massive power grab by the FDA into interstate commerce of food itself. I'm likely to write about it myself, and certainly going to comment formally--not that it'll do any good. IntrA-state, I meant to say. The maximum range at which you can sell your food and still be exempt is 275 miles--which is within the borders of quite a few states. I meant to post that on the previous thread, "A Glossary of Terms". Whoops. Quite a few younger people thought it would be cool to vote for a "black guy" for President. I wonder how many will think it's cool when they lose their job or face extremely high health care payments. Fascinating. It's amazing how integrated everything is. I wonder sometimes why these companies even bother with the whole mess; why feed us crap from the agriculture/fast food companies to make us sick so that insurance companies pay for doctors/hospitals to give us pills/surgery from the pharmaceutical companies that make us feel a little better. I know it's money, but still, it seems like a lot of trouble. Opting out and taking my chances is the only way I know to end the cycle for me and mine. Pump up the volume, pump up the volume, pump up the volume, DANCE, DANCE!